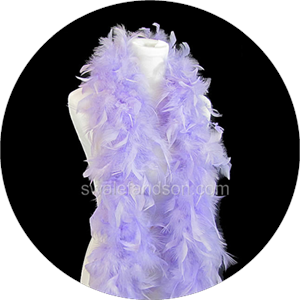 PLEASE NOTE: To make our feather boas as plush and fluffy as possible, we spin them in big dryers before they're packed for shipping. 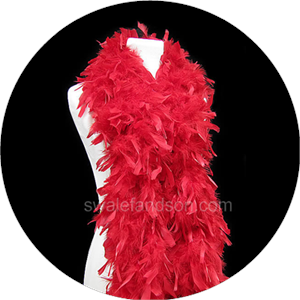 This makes the boas look beautiful but it also requires us to use larger boxes when we ship. Large boxes mean higher freight costs, especially on large orders. Unless otherwise specified, we always spin our boas. If you do not want us to spin them to save on freight, please let us know in the customer notes during checkout. If you choose not to have us spin the boas, they will still be the same beautiful feather boas when you receive them but you will need to give them some love to make them look the same. If it's a nice breezy day, you can hang up your boas outside for a couple hours and they will open up just the same as if we'd spun them. You can also hang them in front of a fan on a low setting. This works just as well.